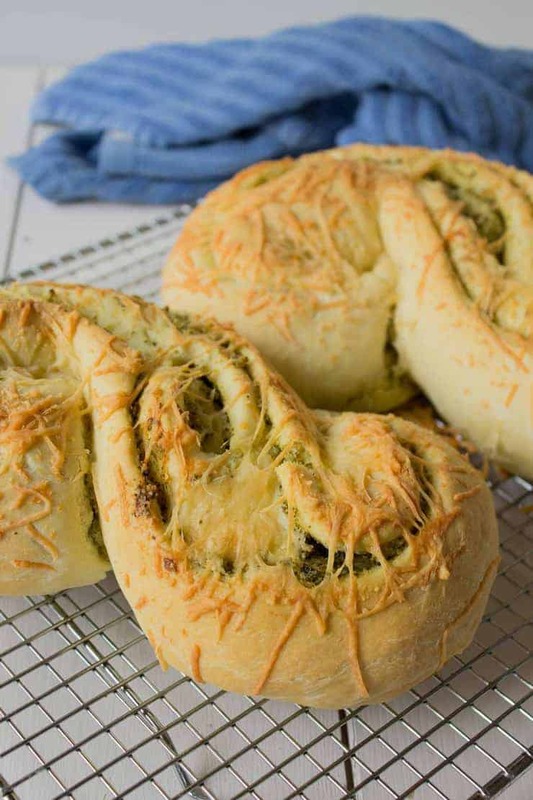 Swirled Pesto and Parmesan Cheese Baked in a delicious Cheesy Pesto Bread. Calling all pesto lovers! You’ve got to try this Cheesy Pest Bread! 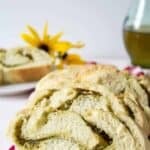 If you love pesto then I’m sure you already use pesto with pasta and on pizza and probably as a sandwich spread, but how about baked right into a crusty loaf of bread? I’ve been eating this bread alongside salads, with pasta topped with marinara sauce and as a savory treat all by itself. 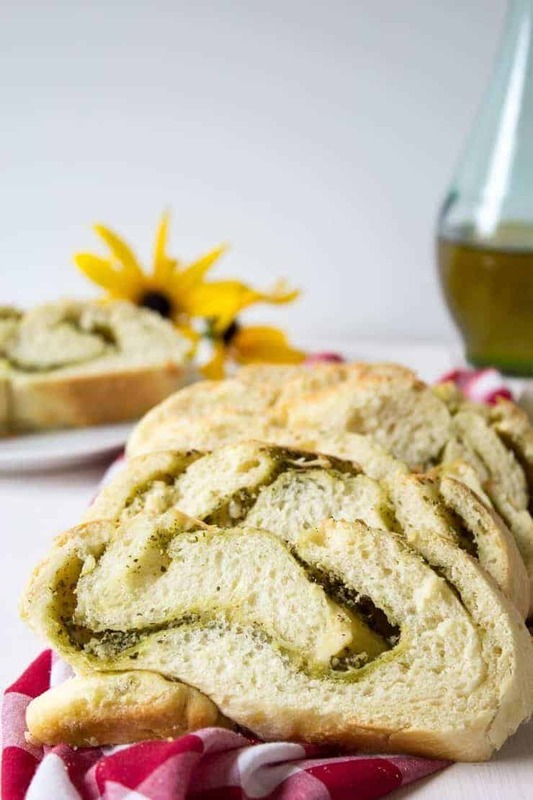 This bread is rolled out like a sweet roll and filled with pesto and parmesan cheese. It’s then rolled into a log, shaped into an “S” and sliced across the top so all the deliciousness is exposed while it’s baking. 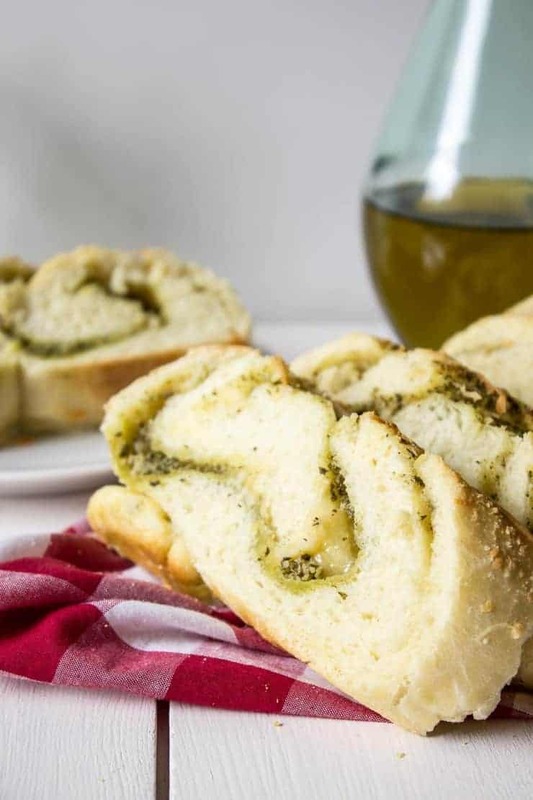 Not only is this Cheesy Pesto Bread delicious, it’s also gorgeous. As the bread rises, the slit begins to open a bit wider. Just before baking it gets brushed with olive oil and sprinkled with more cheese. If you made this delicious bread, I’d love to hear about it! Leave a comment below or snap a picture and tag me on Instagram @beyondthechickencoop. Homemade bread filled with pesto and Parmesan cheese. In a large bowl for a stand mixer, add milk, water and yeast. Stir lightly and let stand for 5 minutes until bubbly. Add egg, salt, olive oil and 1 cup of flour. Mix. Add remaining flour one cup at a time, mixing between each addition. Knead dough in machine for 5 minutes or by hand for 10 minutes. 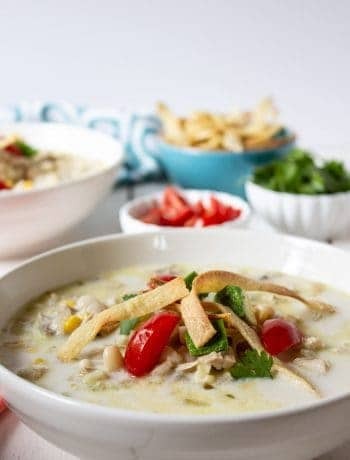 Place in a large bowl that has been lightly greased with olive oil. Cover and let rise until doubled, about 1 hour. 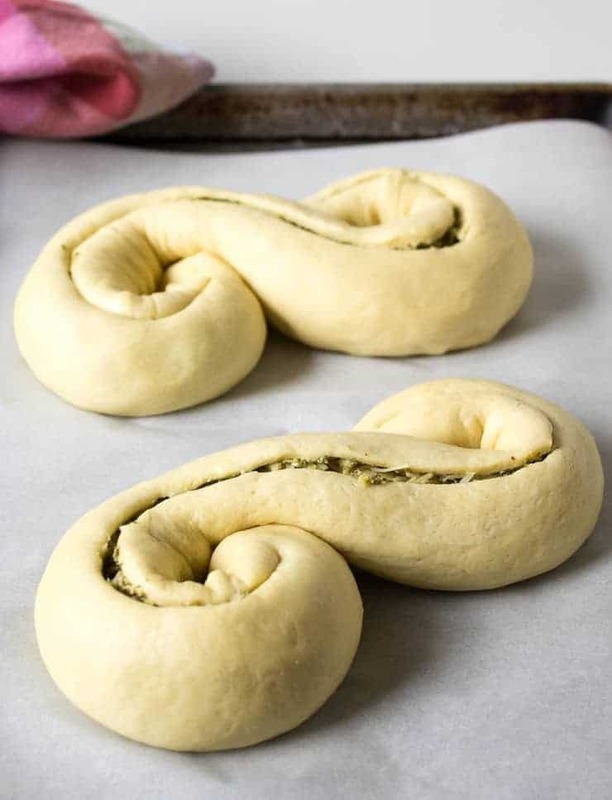 Gently deflate dough and divide into two. Roll out first piece into a long rectangle, approximately 6 X 18"
Add 1/4 cup of the pesto and half the parmesan cheese. Roll dough together to form a long log. 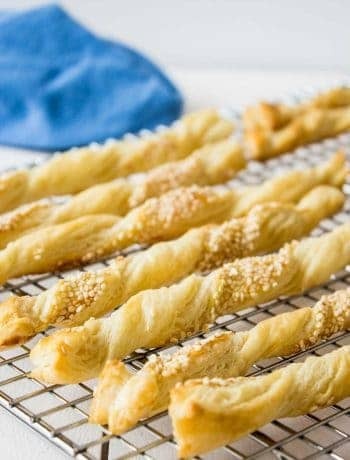 Place seam side down on a baking sheet lined with parchment paper or directly on the baking sheet lightly greased with olive oil. Form bread into an "S" tucking ends into the log. Gently slice through the top of the bread with a sharp knife. You want to slice through about a 1/4 of an inch. 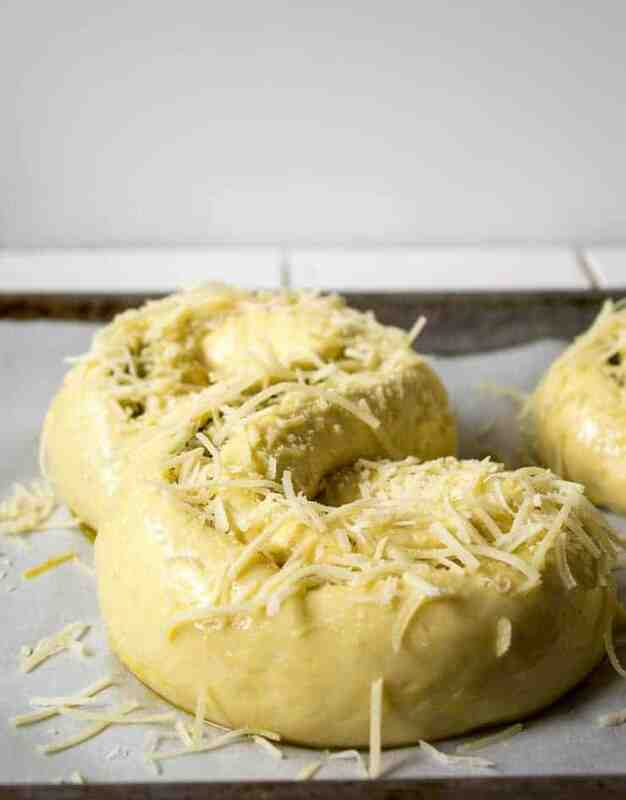 Just before baking, brush olive oil on the dough and sprinkle on parmesan cheese. I love homemade bread…it creates such a wonderful aroma around the home. This is a beautiful recipe, combining pesto into the bread. I am looking forward to trying out this recipe. Absolutely love it!!! The smell of bread baking is so delicious! 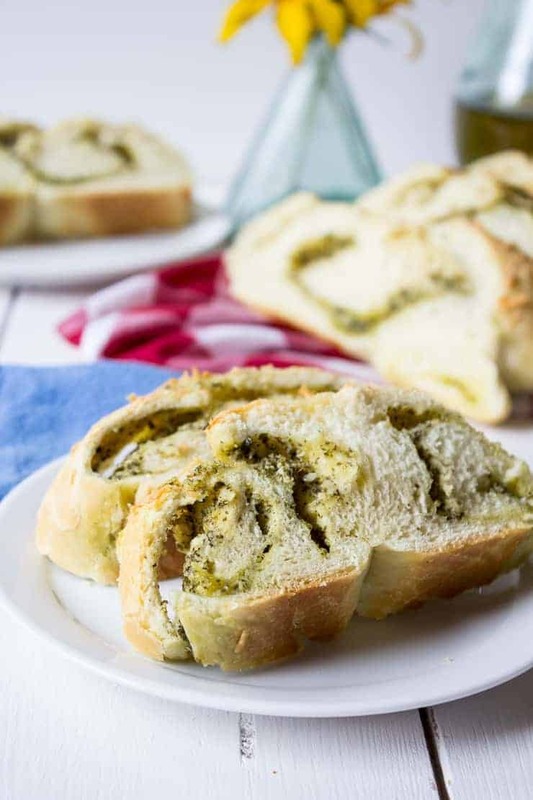 This cheesy pesto bread is one of our favorites. As a passionate pesto lover, this recipe is my cup of tea! Can’t wait to give it a try, Kathy! Would you recommend some salad that goes with it? This would be lovely paired with just about any salad, but I think one with a tangy vinaigrette would be perfect! Oh, how lovely, this is the perfect bread for guests. And I still have dozens of various pesto jars in my freezer. It’s time to use up that pesto! I have just been making several batches of pesto and stocking my freezer. I’m hoping to enjoy this bread all year long! Yummy! Pinned it for future reference. Going to make it for sure!! We have our homemade pesto, and this is another great way to use it up! Hi Nicoletta! I think you’re going to love this bread! It has so much flavor from the pesto and cheese. Love the smell and taste of homemade bread and yours looks so gorgeous too! Pesto & cheese is such a great combination. Have a fantastic weekend, Kathy! Pesto and cheese are a match made in heaven! Me too! It’s hard to stop once you get started! Oh homemade bread how I love you!!! This is such a great idea – my basil and parsley plants are exploding – I need to make more pesto to then make some bread!! Those three words together – cheesy + pesto + bread – are music to my ears! This bread is SO pretty, Kathy! And it looks just delicious!! I could eat a dangerous amount of this and be perfectly content calling it dinner. I mean, it IS acceptable to just eat loaves of bread for dinner when they are this delicious, right?! 😉 Cheers, friend! Oh, I am all about this recipe, Kathy! I love the sharpness of Parmesan, especially when it’s baked into fresh bread. And pesto. Oh man, we made SO much pesto this past weekend. I think it was somewhere between 1.5-2 gallons…not kidding! We gave some away to friends/neighbors, and then we froze the rest. I’m think I need to pull some of that out to make this bread now. 🙂 It looks delicious!! I do love pesto and I definitely love bread so this is a lovely combination Kathy! 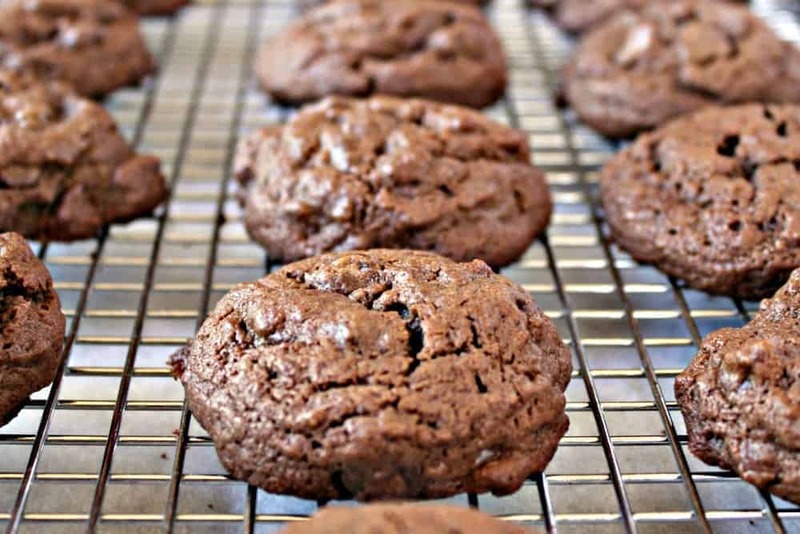 I bet this tastes (and smells) wonderful as it bakes! This one is definitely a beauty! Pinned 🙂 Have a wonderful week! These are so pretty Kathy! You make the best breads! Love that pesto filling! The pesto adds so much flavor!